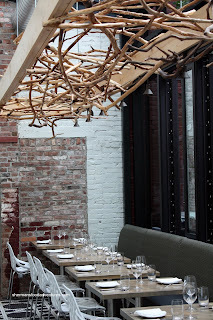 So we are already quite familiar with Melody and her Vancouver Food Tours as well as Michelle's Foodie Tour. I never thought that suddenly there would be an impromptu Sherman's Food Tour. No, no, Melody and Michelle needn't worry. I'm not about to invade their space. Rather, this was the result of Eunice (NY Crumbs) contacting me a few weeks ago. She wanted to try a bunch of things in Vancouver and wondered if I could help her out. Me? Help someone find good eats in Vancouver? Would I!?!?! Duh. So after a few probing emails, we figured out a plan for a full day of chewing. Joining me was no other than Whipping Girl. Boy, she has been MIA for quite a long time. 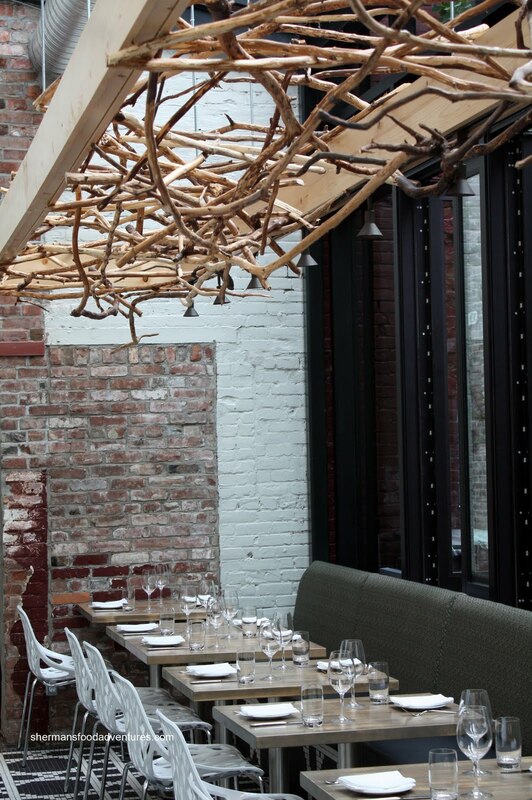 Now, this food tour of sorts had to be focused, in terms of location. I was not planning on taking a big detour to Richmond. And honestly, it wasn't considered for other reasons. Eunice was staying in Downtown and the plan was to stay roughly in that area. Thus, I realize there are better choices than the places we chose; but relative distance was the determining factor. So at 11:30am, we picked up Eunice and headed over to Go Fish. Grayelf, TS & JS met up with us there. We ended sharing cod & chips, scallop sandwich and an oyster tacone. After that we were planning on going up the street to Lin; but they were closed! For the love of... Okay, backup plan, we head over to Long's and you guessed it, closed. What's with closed Tuesdays??? Fine, last ditch effort without heading to Richmond, we finally succeeded at Shanghai Village. Still decent eats, we were satisfied. Well, not really satisfied because we proceeded to Chinatown and made a pit stop at New Town and then an unplanned stop at Phnom Penh. C'mon, how can we not take Eunice for some Fried Chicken Wings and lemon pepper sauce??? Yum! Then it was off to La Belle Patate for a Traditional Poutine. Eunice was not really sure about it, even after trying it. Unlike previous visits, I found the fries to be quite dark and limp. Not a good day I guess. From there, we hightailed it over to L'Abattoir to meet up with TS/JS once again and Ann/Dee from MePlusFood. 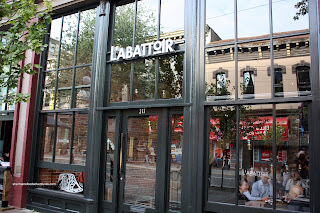 Located in the heart of Gastown sandwiched in between Cork & Fin and Vera's, L'Abattoir opened in early July. 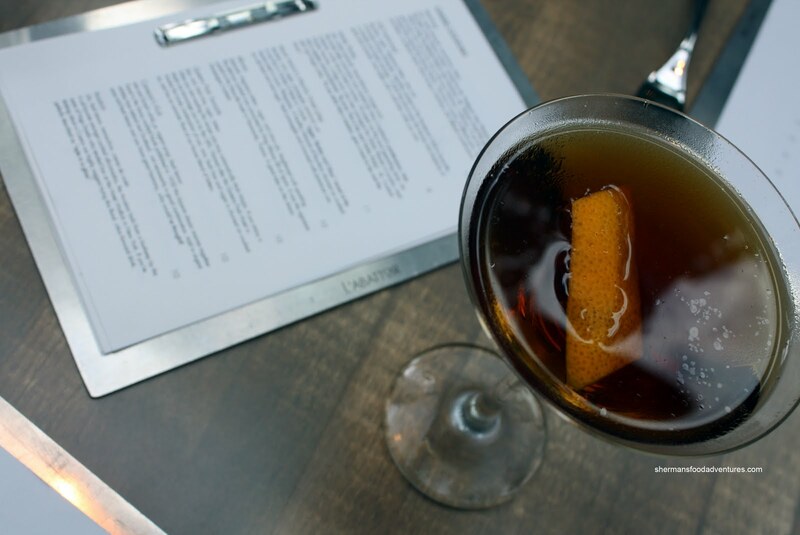 From then on, there has been a steady amount of buzz about the place. 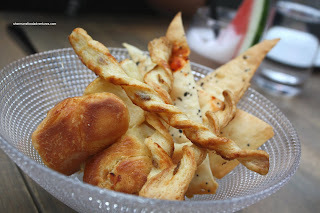 I was fortunate enough to sample an item during the Hot Chefs Cool Jazz event and was looking forward to an actual meal when the restaurant officially opens. While waiting for our table, we ran into Melody. She was doing one of her popular Gastown food tours. I sheepishly told her I was giving Eunice a "tour" and she gave me the evil eye. LOL... After a short wait, we were seated at the back of the restaurant in a dining space with lots of natural light and pretty decor. 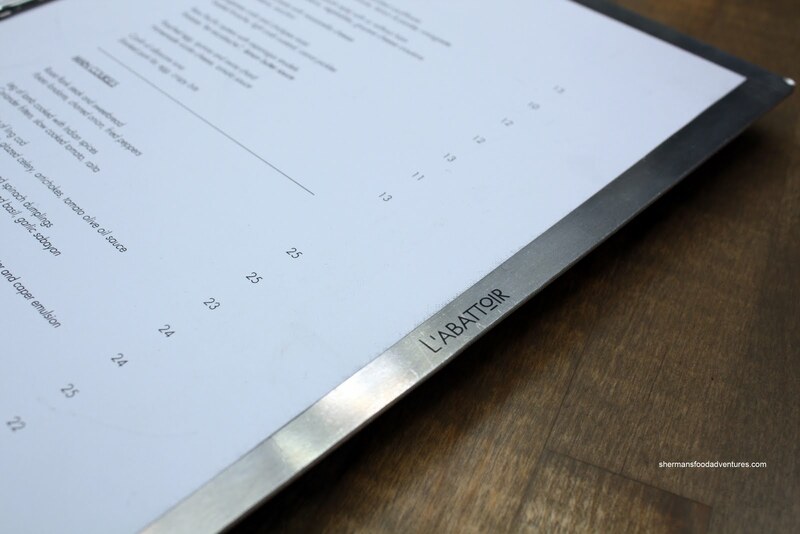 I thought the stainless metal menu holder (with L'abattoir engraved on one side) was pretty cool. Of all the cocktails available, the Hanky Panky stood o ut. Of course it did. I just really wanted to ask for some "hanky panky". Whipping Girl and TS just looked at me in disgust. I'm so juvenile... We were presented with 3 different types of complimentary baked goods including Bacon Brioche, Anchovy Swizzle Sticks and Housemade Flatbread. I love both brioche and bacon, so for me, that rocked. I also liked the anchovy sticks. Plenty of flavour and a nice crunch. 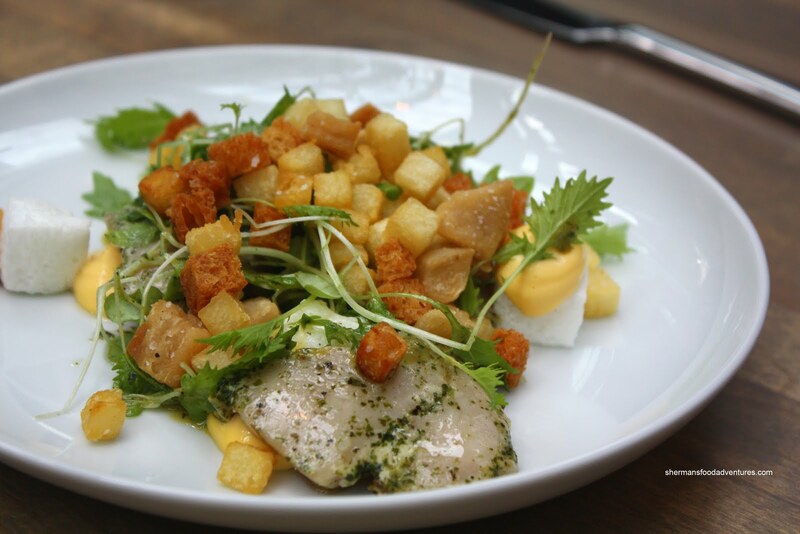 Eunice and Whipping Girl ended up sharing 3 appetizers starting with the Confit of Albacore Tuna with smoked pork fat, crispy bits and egg. TS/JS also shared an order. It was universally agreed that this appy has potential. The tuna was perfectly cooked having a nice texture. We were divided over the presentation. Whipping Girl and I thought it was pretty, while TS/JS thought it was messy. We realized that the brioche and pork croutons were there for mostly a textural contrast; but we all felt it was not really all that necessary, especially the overpowering greasy saltiness. The interesting use of the egg whites and yolk was a nice touch in my opinion. The one dish I had already sampled at the Hot Chefs Cool Jazz event was the Dungeness Crab and Chickpea Toast. 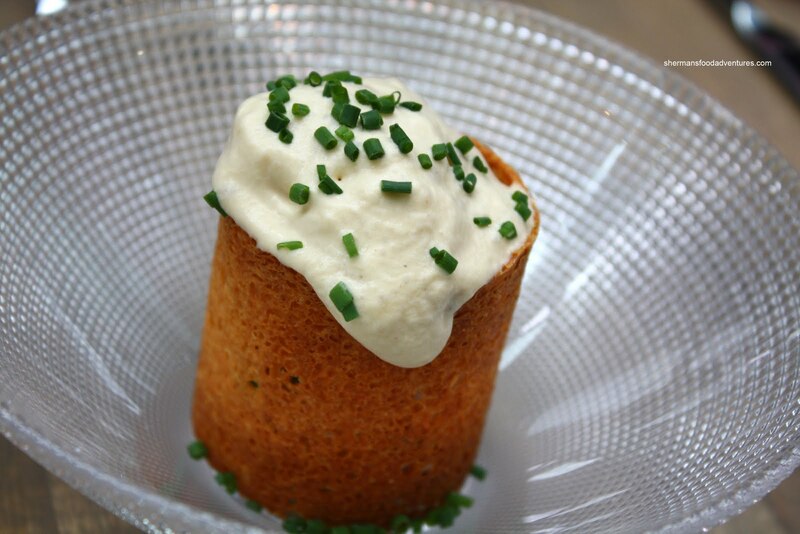 The brioche toast is formed into a cylinder and is filled with crab custard, chickpeas and carrot pickles. This starter also divided the table. JS/TS didn't really like it since they thought the custard was goopy and fishy. For me, I am a bit indifferent. I liked the sweet fluffy crab; but I did agree that the custard was not exactly appealing. While some didn't like the presentation, WG and I thought it was creative. 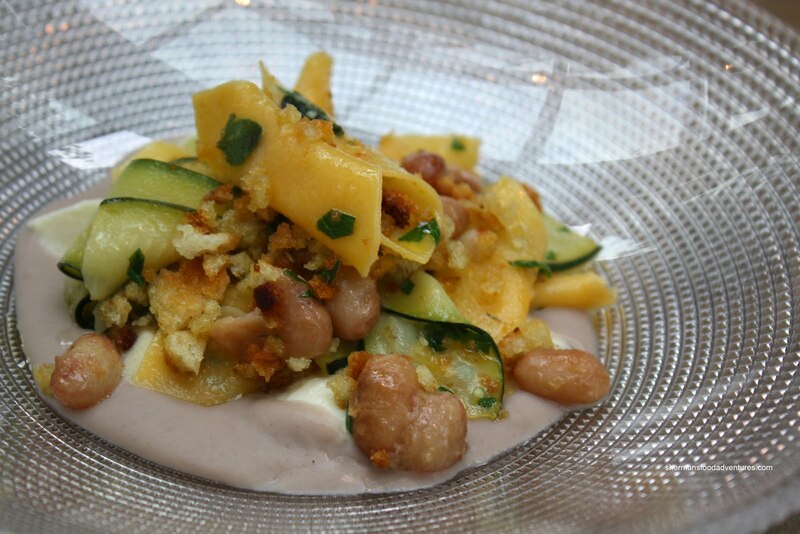 Third appy was the Mostaccioli Pasta with mozzarella cheese, Borlotti beans and zucchini. Both WG and JS thought this was a nice simple dish, though not a lot of flavour going on. JS surmised that it could have used a touch more acidity to liven up the flavours. Despite this, the dish overall was unusual (points to them for that) in that it used beans as a "sauce" for the pasta. Both of them agreed that the pasta was nice, not mushy and not too chewy either. Mozzarella cheese quite good, springy and rich (but not too rich). JS summarized that the flavours, as it were, were "muffled," kind of like listening to music in the next room. Each individual flavour in the dish (pasta, beans, cheese, zucchini) came through well enough but it needed something else to make it all in stereo or sound surround or whatever sound technology is the cutting edge nowadays. This was good -- but could have been great. The last appy that WG and Eunice shared was the Raw Pacific Oysters with asparagus strudels, potatoes "en escabeche" and lemon butter sauce. I was able to sample a large portion of this dish because they didn't care for it. The phyllo wrap was slightly burnt while the components on the dish didn't seem to be in harmony with each other. Although, it was nicely plated. 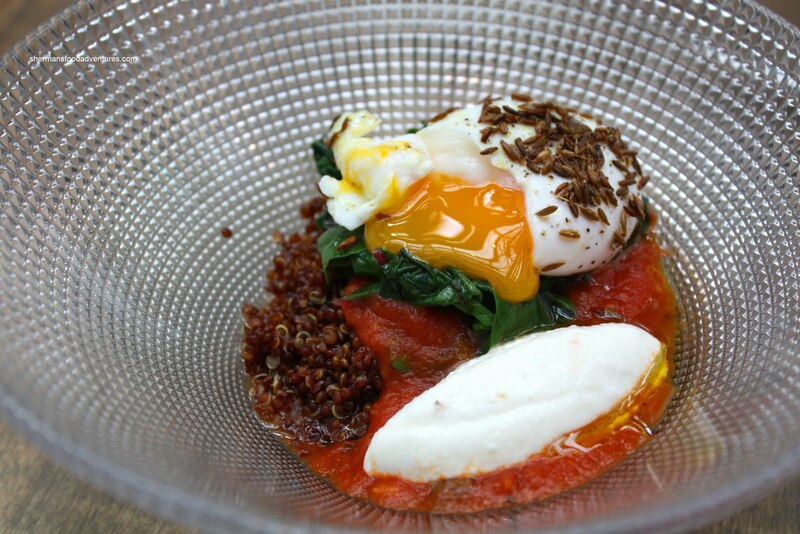 However, the appy that I chose, Poached Egg, quinoa, swiss chard with homemade ricotta cheese, tomato sauce was a big hit. 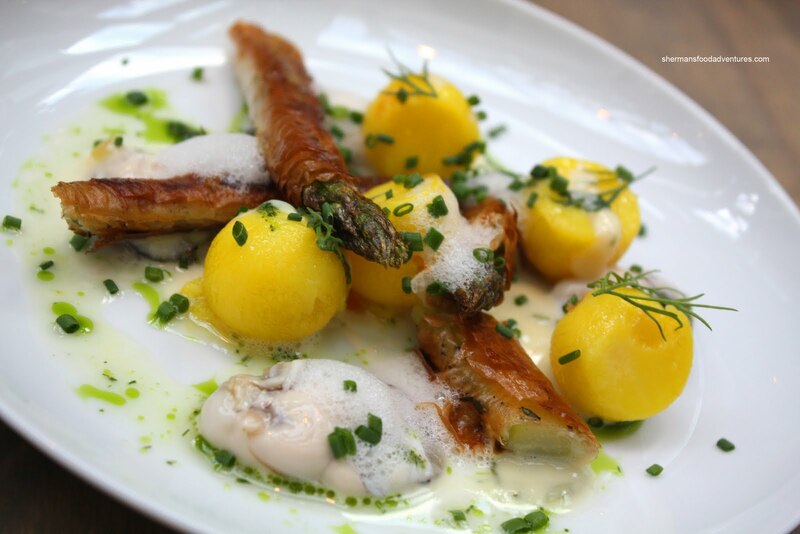 Such a simple dish; yet the subtle flavours really worked well with each other. From the fresh tasting tomatoes to the firm pop of the quinoa, it was pleasant scoop one after another. So far, the plating was one of the highlights. Upping the whimsical quotient a notch was the Poached halibut with mussels, spinach dumplings, ragout of early summer vegetables & basil and garlic sabayon. The layer of sliced zucchini created the "scales" for the piece of halibut. JS remarked that it was nicely-cooked, as the flesh still retained a bit of give. 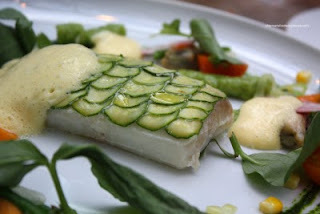 She liked the presentation of the plate overall: it looked very fresh, very garden-y (although maybe it reminded her of Hieronymous Bosch's garden, with the cucumber scales and all). All of the vegetables on this plate were marvelous, better than the fish (which TS thought had a hint of fishiness), which needed a little bit more seasoning (salt and a touch of acidity). Dee ended up with the Roast Flank Steak with sweetbread, potato fondants, charred onion and fried peppers. I sampled the steak and it was quite moist. The star of this dish had to be the fried cracked peppercorns. The intensity of the pepper flavour combined with a hard crunch made the slices of meat come alive. 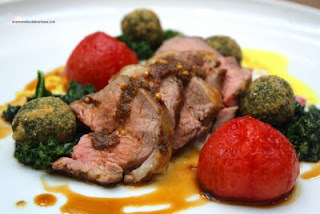 For my main, I went for the Leg of Lamb cooked with Indian spices, coriander fritters, slow cooked tomato and raita. 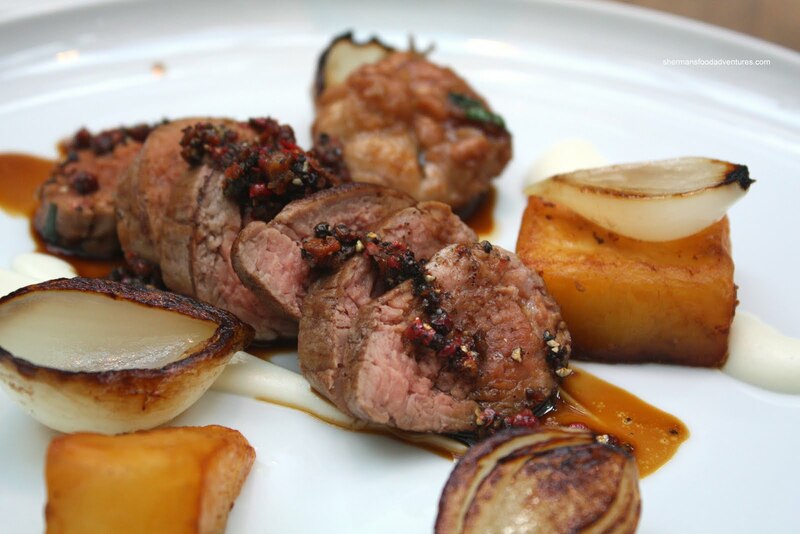 As for the lamb, it was cooked perfectly; thus being tender. I could've done without the coriander fritters, they were much too strong tasting. The tomatoes were awesome. One bite and it bursts with a sweet tartness. The accompanying Swiss chard was cooked perfectly; if not too salty, exhibited good colour and texture. Overall, all of us agreed that the meal was pretty solid, especially considering that L'Abattoir is a fairly new restaurant. Of course there were many minor issues that were part of the critique from JS/TS and Whipping Girl; however, they enjoyed the meal as a whole. There is nothing that is perfect and of course, personal preference has a lot to do with it. 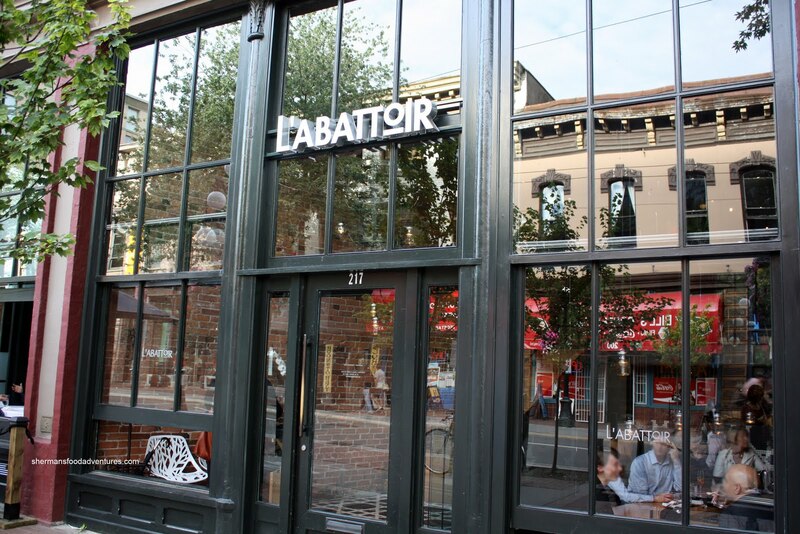 If we take into account the ambiance, level of service, pricing and food execution, L'Abattoir is a very welcome addition to what is quickly becoming the gastronomical heart of Gastown. Melody giving you evil eye? Ha! Thanks so much for the extravagant food tour, Sherman! It was so nice meeting you and the group. I think I might be eating salads for a month when I get back to NY but it was well worth it :) Let's do it again soon! Thanks GG! Yes, I should go back too!